On the subject of best books of 2015 we thought we’d crunch some numbers and find out what’s been going out at Wellington City Libraries. Interesting results! For people who like statistics, All the Bright Places went out an average of 13.2 times per copy which is a top effort considering books are issued for up to 3 weeks! This week we have a list featuring animals – magical animals, to be precise. If you just want a taster, try a short story from the collection Unnatural Creatures curated by our fave Neil Gaiman. If you know what you’re in for, try the dark tale The Knife of Never Letting Go (Manchee the dog is the comic relief here) or perhaps an interpretation of the Grimm brothers fable The Goose Girl. Whatever you choose, expect a talking dog. Or bear. An animal will probably be able to talk. Down the Mysterly River / Bill Willingham ; illustrations by Mark Buckingham. Unnatural creatures / stories selected by Neil Gaiman with Maria Dahvana Headley ; illustrated by Briony Morrow-Cribbs. Also available as an Overdrive eBook! The princess and the hound / Mette Ivie Harrison. The twyning / Terence Blacker. The knife of never letting go / Patrick Ness. We also have the Bolinda eAudiobook & Overdrive eBook versions. Winter falls / Nicole Maggi. Also available as an audiobook on CD and Overdrive ebook. Pom Poko [videorecording] / a film by Isao Takahata. A community of magical shapeshifting raccoons desperately struggle to prevent their forest home from being destroyed by urban development. Tender morsels / Margo Lanagan. Also available as an Overdrive ebook. 03.03.15 | Permalink | Comments Off on There’s something about… Kimberley! At request, I have found some books featuring Kimberley, Kim and Kimmy! This was a bit trickier than finding Hannahs, but it’s so fun finding what variations in story can come from the same name! The end or something like that / Ann Dee Ellis. Hacking Harvard : a novel / by Robin Wasserman. If I stay / Gayle Forman. The boyfriend list : 15 guys, 11 shrink appointments, 4 ceramic frogs, and me, Ruby Oliver / E. Lockhart. Clarity / by Kim Harrington. Lists, Rachel, Sci Fi, Science! Time travel is one of my absolute favourite plot tropes, and it can be handled very differently from story to story. Sometimes more serious, sometimes less so. It’s also interesting to see how different interpretations deal with time continuity, and what happens when the past (or future) is altered. Here are a few time-travel picks which I hope you’ll enjoy! The here and now / Ann Brashares. The 57 lives of Alex Wayfare / MG Buehrlen. A thousand pieces of you / Claudia Gray. After Eden / Helen Douglas. Short reads for the beach! 06.01.15 | Permalink | Comments Off on Short reads for the beach! 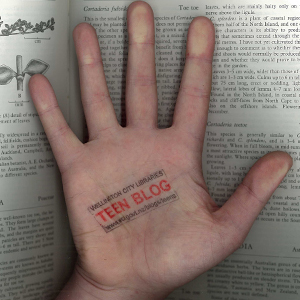 Welcome to 2015 here on the Teen Blog! We hope you’ve had a fabulous holiday time & new year, maybe you’ve made some resolutions? If you have, let us know in the comments below! For now, we’ve gathered a few short’n’sweet treats for you, the perfect picks for chucking in your bag to read in a day on the beach. All these books are around 200 pages or less, but they all sound thrilling in their own way. We hope you can find something to suit your tastes, or perhaps a new direction in which to take your reading direction in 2015? Have fun! Au revoir, crazy European chick / Joe Schreiber. Boy meets boy / David Levithan. First day on earth / Cecil Castellucci. The espressologist : a novel / by Kristina Springer. Ten miles past normal / Frances O’Roark Dowell. The whale rider / Witi Ihimaera.